The first footage from Star Wars: Episode IX debuted today at Walt Disney Company’s 2019 Annual Meeting of Shareholders and, based on the security surrounding the event, the footage likely won't make its way online, though one attendee did offer up their account of what was presented. 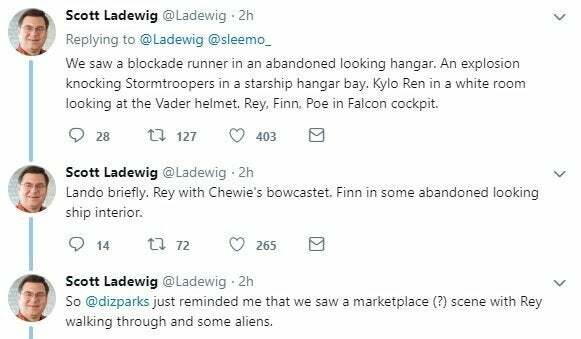 Over on Twitter, user Scott Ladewig claimed to have been in attendance at the event and offered up his description of what he saw. The brief footage is said to have been a mix of both behind-the-scenes shots as well as footage that appeared to be actual scenes from the film. The reel included "blockade runner in an abandoned looking hangar. An explosion knocking Stormtroopers in a starship hangar bay. Kylo Ren in a white room looking at the Vader helmet. Rey, Finn, Poe in Falcon cockpit." Ladewig added that the footage featured "Lando briefly. Rey with Chewie's [bowcaster]. Finn in some abandoned looking ship interior." He then noted that one shot featured Rey walking through what appeared to be a marketplace with multiple aliens. This description might not feature any groundbreaking revelations about what to expect from the film, but knowing that this sizzle reel exists at all and was screened for the public has us excited that it could make its way to the internet in some way, shape, or form. Now that filming on the sequel has concluded, members of the cast and crew have been able to promote other projects, resulting in journalists trying to pry any details they can from those individuals. Oscar Isaac, for example, has been coy about the film, though recently promised that fans are sure to be surprised by the sequel's spectacle. "It was the most fun it's been. There was just an energy and a looseness and excitement to the whole production," Isaac shared with the Associated Press. "And knowing that this was the conclusion of not only our time there but the nine stories, these nine episodes of the Skywalker Saga, it's incredible. And I think people are gonna be just blown away." What do you think of this description? Let us know in the comments below or hit up @TheWolfman on Twitter to talk all things Star Wars and horror!